A master photographer, Alfred Stieglitz was also a visionary promoter and an avid collector of modern American and European art from the first half of the twentieth century. Operating a succession of influential Manhattan galleries from 1905 to 1946, he exhibited many of the most important artists of the era, including Constantin Brancusi, Charles Demuth, Arthur Dove, Marsden Hartley, Vasily Kandinsky, John Marin, Henri Matisse, Georgia O'Keeffe, Francis Picabia, and Pablo Picasso. The collection he assembled of their works-by purchase, gift, and happy accident-was of exceptional breadth and depth and has since become the cornerstone of the Metropolitan Museum's holdings of modern art since 1949. 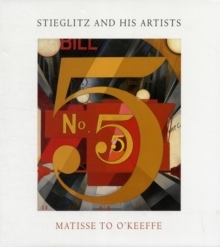 This volume is the first catalogue of the Metropolitan's unparalleled Alfred Stieglitz Collection: more than four hundred paintings, sculptures, drawings, and prints made between the 1880s and the 1940s. After an illuminating introduction that traces the collection's formation and surprising denouement, thirty-one short essays serve as focused biographies of the dealer and each of the artists he cultivated and collected, demonstrating the intense and often intimate relationships that affected artistic direction, financial well-being (or its opposite), and social and professional prestige. These discussions are enriched by new scholarship, technical analysis, and archival research, and many works in the colleciton are published here for teh first time. Seen together in splendid color reproductions, they present a portrait of a supreme connoisseur-a man who acted as "midwife" in the creation of twentieth-century art. Pages: 360 pages, 785 color + 15 b-w illus.